The magnifier of the Steinheil type is composed of a biconvex lens with strong curvatures made of crown glass and two negative meniscus lenses of flint glass cemented on both sides of the central positive component with excellent chromatic correction and a reasonably wide field of view. These magnifiers of various magnifying powers have been long and widely used for preliminary inspection of microscopic specimens. The Steinheil Loupe is designed as pocket able high grade, light weight magnifier. The cemented lens block is mounted on a light weight barrel made of black plastic and a sliding frame of the same material covers and protects both the lens surface from dust and mechanical damages. 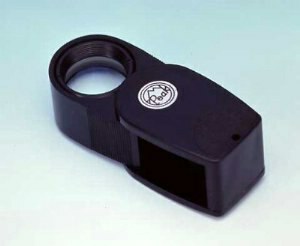 The frame forms a convenient handle for gripping the loupe.